I’ve got a lot of questions on my mind today! 1. Are you LOVING the time change? Sunshine during my evening runs? Heck yes! 2. Do you play with your food, too? 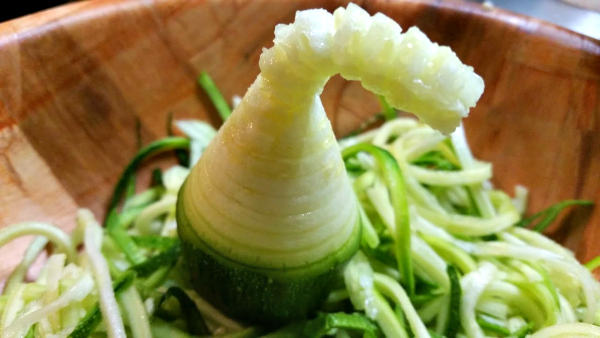 Every time I make zoodles (zucchini noodles) I look forward to this guy showing up at the end. 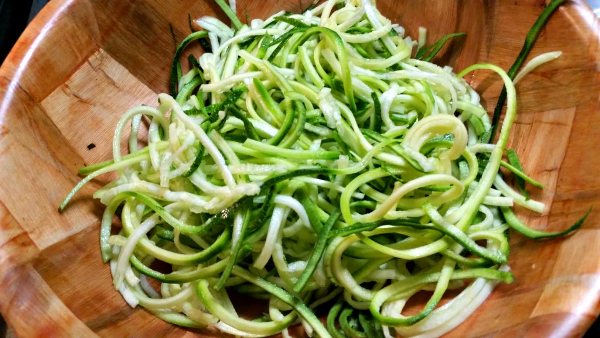 I love zoodles. Green is my favorite color! 4. 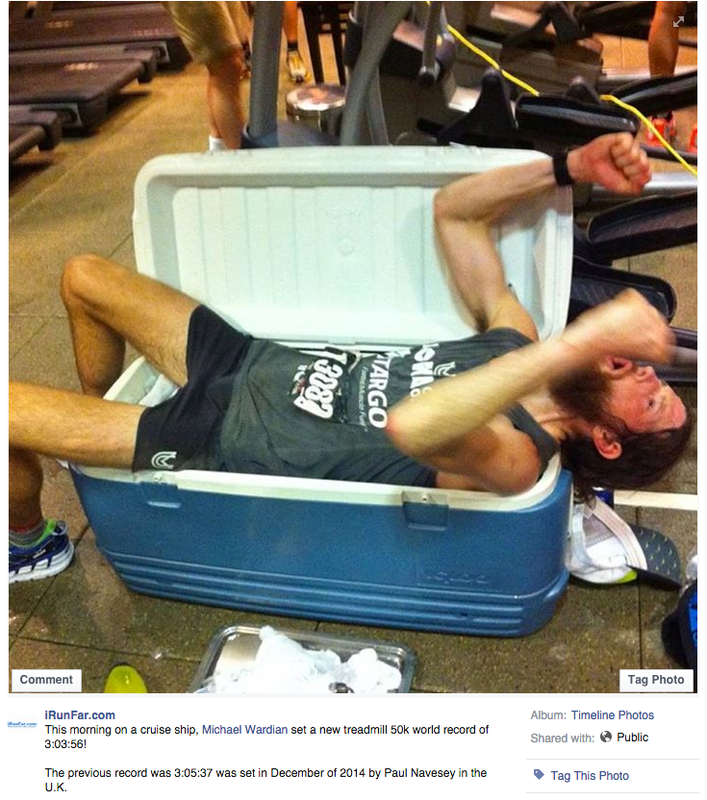 Did you see yesterday ultraunner Mike Wardian set a new 50K treadmill world record – 3:03:56?! 5. Should I dye my hair like this? You know I am obsessed with Mindy Kaling and I’ve got a hair appointment coming up. Should I go for it? How annoying is it to keep up with dyed hair? Do you have to wait a long time in the salon for it to be done? Is this hair trend on the way out? I have no clue! Ladies, I definitely need your input on the hair thing! Can you imagine running 50K on the treadmill in 3:03? DANG! Next Post Race for PAWS 5K/10K Update! I stopped highlighting my hair about 3 years ago because I hate paying so much to keep up with it! But I do think that look is cute. I could not imagine running for 3 hours on a treadmill and I certainly couldn’t imagine running 50k in that amount of time! The time change has been rough; I’m not a fan of driving to work in the dark. But it has been easier to stay active in the evening! 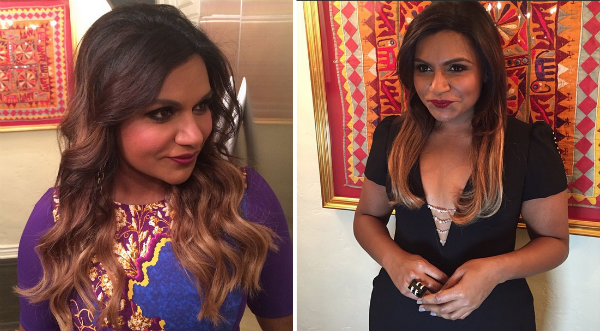 I’m not a big fan of ombré but Mindy can do no wrong! I can not imagine running 50k on a treadmill or running 3 hours on a treadmill. And I definitely would not be capable of doing both of those feats in one go! Holy crap I can’t imagine running a 50k that fast and on a treadmill nonetheless! That is amazing. I think that hair would look great on you. You should go for it! The part that really gets me is that he did it on a cruise ship. I guess he doesn’t have any issues with motion sickness. Also, three hours on a treadmill sounds like the worst thing ever. You should totally dye your hair like that! I love that style. I am loving the time change–evenings seem so much LESS stressful with daylight! I am going to check out irunfar today–Love Adam’s comment. 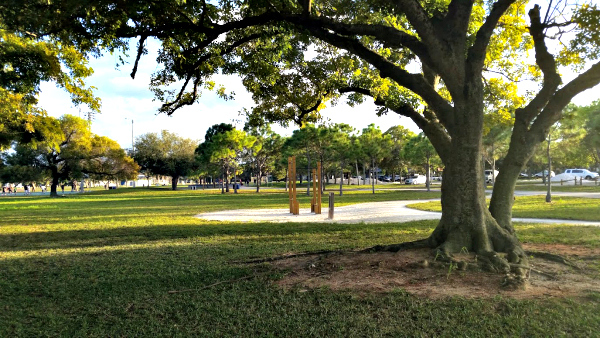 You gotta admit, the ultra community is a different crowd! i love the hair – go for it!! I have had my hair colored for so long that we don’t even know my true color any more!!! That is a fast 31 miles!!! If you stylist knows her stuff this would look great! I don’t trust many people with my hair so I am always a skeptic on stylists!! 🙂 50k…on a treadmill….that fast! ummmm yeah I would be broken! Plus on a cruise ship…that would have to feel weird…maybe not. I love having the sun up so I can run outside after work!! It is such a relief! I can’t believe he ran 50k on a treadmill and then ran 50k on a treadmill again less than 2 days later. He must have endless capacity to endure boredom. The ombré is about as low-maintenance as hair color can get, because if you use your natural color for the top part it doesn’t matter when your roots grow out. If you have super straight hair I’d talk to your stylist about it first. It can be hard to get it to look “right” on straight hair, so I’d just want to gauge his/her confidence level with the technique and your hair. Unless you are ok with regular heat styling, but I imagine that is a futile effort in south Florida. I think if you want to dye your hair you should go for it! Personally I am not a huge fan of the ombre look, but as far as maintenance goes ‘ll echo what others have said that ombre has to be the most low-maintenance way to dye your hair there is! I wouldn’t worry about the upkeep at all! I agree with Adam that they look homeless. I LOVE THAT. True athletes in it for the love of the sport not the big contracts and paydays. 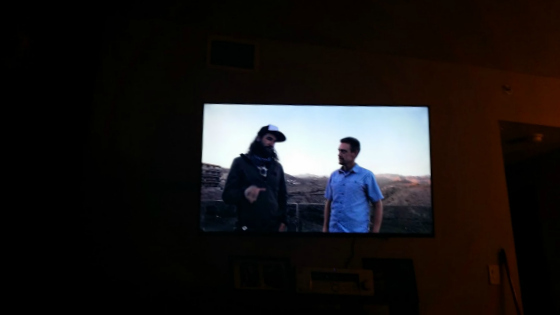 I loved reading about Anton living in someone else’s closet/couch when he was training for one of his big races (Western States or something?). I am soooo not a hair expert. 🙁 I dye my hair with the boxed stuff because I have gray roots and don’t want to spend the money to keep up with it! I never had zoodles. It would be a great way for me to get those veggies in, though! I say you should definitely go for it with the hair! You can always dye it back if you don’t end up liking the color. I could not imagine running that far on a treadmill. Actually, that seems like my idea of torture. If you’re going to dye your hair, I figure that ombre style is probably the way to go – no roots as it grows out! That’s the main reason I don’t dye my hair (did a couple times in high school and college), I just can’t stand it as it grows out, and no way I’m going to deal with maintaining it on a regular basis. I can’t imagine doing a treadmill run for 3 hours, and I sure as heck wouldn’t get anywhere near 50k if I tried! Yes, yes, yes on the hair color! If I had long hair I’d totally do it. The zoo does are so cute! A 50K on a treadmill? O_O I’m impressed. 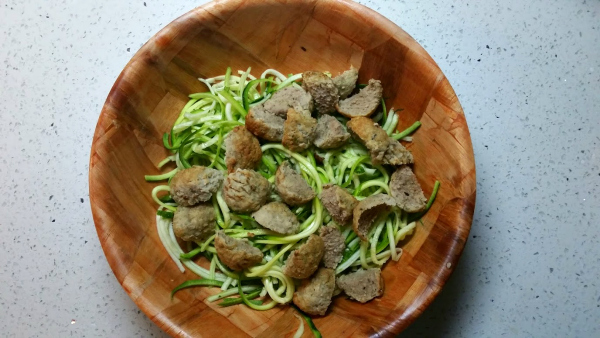 Your zoodles look really good! Where did you get your bowl? I really like it! Hair is definitely one of those things I invest time and money into. It’s my pampering moment three or four times a year. ☺ I’ve been highlighting my hair for years because my natural color is so boring. Plus, my hair is always lighter during the summer months, so I like to switch it up. I say give it a try – you can always change it or do something different if it doesn’t “fit” with you. If Mindy can sport it, so can you!